Shannon is a multifaceted fiber superstar, omnipresent in the fiber and craft world, with her newest book Spin to Knit (Interweave Press) out this month. She has published two books in her Knitgrrl series (Watson-Guptil), and has four more books waiting in the wings on a variety of fiber topics. We especially love Shannon because she wrote the very first spinning article for Knitty: Spinning for Absolute Beginners. For this issue of Knittyspin, Shannon answered a bunch of spinning questions for me, her nosiest fan. What's your favorite fiber or blend? I really love wool the best, but if you're going to mix something in, make it lyocell, Soysilk®, shredded sari silk...something natural. I'm not a big fan of sparkly add-ins like angelina, but I do love the extra shine lyocell gives. 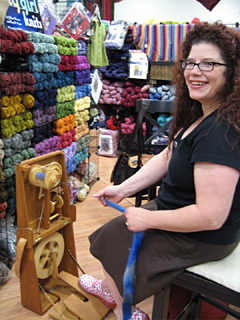 Sandy Sitzman of Woolgatherings dyes intensely beautiful superwash merino/lyocell blends that are really fun to spin. I shattered my elbow a number of years ago and it tires my arm really fast if I spindle. Though, I do like the Spindolyn, which is a supported spindle. I started on an Ashford Kiwi wheel and Ashford wheels are what I use today. I have two of them, Queen Liz (an Elizabeth II) and Joy, my portable single-treadle Joy wheel. Can fiber be done as a job, and actually pay bills? It can be done...but it's tough, and there are often many trade-offs in the beginning. Right now, I'd like to expand my hand-dyed fiber business, but I don't have enough time. Many other people have the time but not the money for additional equipment and materials. My best advice is to start small: sell online, sell to local shops, get a booth space at a craft show, farmer's market or fiber festival. Build up a following before you quit your day job -- one big order isn't going to pay the bills all year. When I opened my original online shop, two years before my first book came out, I knew I had good product but I didn't know how many sales I could count on in a month. To this day, a good show or festival booth can make many, many weeks' worth of sales all in one day. So start there! My first spinning teacher, Lucy Lee, who owns Mind's Eye Yarns in Cambridge, Massachusetts, was my original inspiration. Her handspun and hand-dyed yarns are gorgeous. Lynne Vogel's Twisted Sisters Sock Workbook inspired me to pull out the dyes for myself. The hat on the cover of Spin to Knit is made from the first fiber I ever dyed myself! I took Lynne's color mixing advice, then developed my own dyeing technique using the dishwasher. When I traveled around the country last summer taking photos for the book, I got to spend several days at a workshop Lynne was teaching in Tennessee. Between taking photos, dyeing and spinning, I think I learned more in a day than I would've worked out on my own in a year -- she's great! What books do you have handy for inspiration ? I have Squidoo lenses (handspinning, spin-yarn, dyeing) that showcase some of my favorite spinning and dyeing books. The Twisted Sisters Sock Workbook, of course. Dyeing to Knit by Elaine Eskesen is good, too. Handspun Revolution by Lexi Boeger of Pluckyfluff for art yarns. Any other inspirational jump starts? My new favorite source of inspiration is flickr -- and not just the spinning- or dyeing-related tags. I'll get an idea for a yarn -- let's say I want it to look like a frog. So I search for photos of frogs...and find out they're not all green, maybe one of them has some interesting red and yellow spots...so then I add red and yellow to the green yarn I was planning to spin. It's a very organic process. In terms of finished items, I like to read fashion magazines like W that feature over-the-top haute couture -- I have a to do list of spinning and knitting projects a mile long just based on the pages I've torn out. Favorite music to spin by? Buffy the Vampire Slayer DVDs are my background noise of choice. Join the Spin to Knit Handspun Secret Pals SWAP! Interweave Press is celebrating the launch of Spin to Knit by Shannon Okey (in bookstores nationwide by October 1) by starting a new kind of Secret Pals Exchange: The Handspun SWAP. Signups are October 1-December 1 and you'll receive two handspun skeins of yarns -- one in January and one in February -- from your upstream secret pal; in return, you mail two handspun skeins in two months to your assigned downstream pal. This exchange is open to spinners everywhere, with three pal categories for new, intermediate, and advanced spinners; participants are required to have a blog. What's your all time spinning f-up? The first time I spun bombyx silk top was a disaster. Truthfully, I think I like spinning soy silk more! No matter what I tried, my finished product was coming out alternately shaggy and overtwisted. Also, I'm not too fond of the way it felt in my hand as I was drafting -- so after half a bobbin, I put it aside. Maybe I'll blend it in with some wool or alpaca and try again when I have time. I don't ply very often, because I love knitting with energized singles, and I'm often just too eager to get knitting on something! In my mind, that extra ply just means I'm depriving myself of 50% more yardage to knit! Mostly I ply for color effects: combining different sections of color into one gorgeous, multicolor yarn is really fun. What spinning advice to you have to share? If none of your friends spin, look for a local shop or guild and take a few lessons. Many guilds will even rent equipment. This is a smart way to try before you buy if you're not comfortable with spindles, but aren't sure you want to spend hundreds of dollars on a wheel. (Although I do recommend Ashford's low-cost starter model, the Kiwi -- it's what I started on). Start with wool: it's the most forgiving fiber for beginners because it's got a lot of natural give to it. For those who are allergic or don't like to use animal fibers, try soy silk -- slipperier than wool, but easier to spin than cotton if you ask me. What's next on life list? Vacation for the first time in years, and desperately needed! In the past 2 years, I've written, co-authored or edited 7 books. I think I deserve a break. On the horizon: I've just started my own publishing company and I'm going to be revamping my online shop in the fall after our book tour. Speaking of which: Kim Werker, the editor of Crochet Me, just wrote the crochet counterpart to my Knitgrrl books, Get Hooked, and we're hitting the road for a quick east coast Canadian/US tour in October. knit.1 magazine is sponsoring lots of great stuff for the tour, so be sure to check it out if we're near you! Also, I think I should mention that the tour kicks off in Toronto with Team Knitty's Run For the Cure, which I'm proud to be a part of for the third year in a row. Everyone who donates through my page gets entered into a drawing to win some killer prizes...from yarn to a Lexie Barnes knitting bag. If you could Vulcan Mind Meld with a fiber goddess, who would it be? Are we talking Clothos, Lachesis or Atropos? The Norns? Athena? Or human with goddesslike qualities? (Though I did dress up as Athena for Halloween when I was about 7. I blame Clash of the Titans, not a budding fiber thing). If we're going human, I'll say Lynne Vogel. Her color sense is amazing! Your spinning is like which '70s or '80s tv show or cartoon? Pee-Wee's Playhouse: irregular, fun, colorful and low-stress! Also, prone to shouting when the secret word gets uttered. I'd tell you what the secret word is, but then I'd have to kill you. Spin to Knit is exactly what the title says: a book designed to teach existing knitters, crocheters and other fiber fans how to make their own fantastic yarn! It includes lots of step-by-step photos, profiles of spinners from across the country, and an entire section of handspun-friendly patterns by both myself and some other very cool designers. I had the best time taking photos for this book. It's inspirational in itself to see where other spinners are coming from in terms of their studio space, where they live, what's going on in their communities...and I found some great spots to buy fiber along the way. (Let's just say that if I won the lottery, I'd probably be moving to Granville Island in Vancouver, BC). Interweave Press, the publisher of Spin to Knit, is sponsoring a secret pal swap. We're going to have a great time trading yarns with other secret spinner pals. You can find out more on the Spin to Knit website. Also, check out Orangina from Spin to Knit in this issue of Knittyspin! 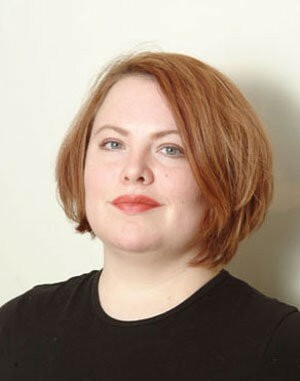 Jillian Moreno is the editor of Knittyspin.